Your community likes to think of you as a superhero when it comes to organizing. Classroom parties coordinated…POW! Church volunteers scheduled….BOOM! Sports carpools planned for the season…KABAM! But superheroes are on-the-go, and we get that. That’s why we’ve just added a new super power to your arsenal. 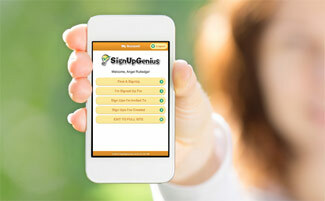 Welcome SignUpGenius Mobile. Now you can sign up on standard, payment and RSVP sign ups quickly on your mobile devices. Because when you’re a superhero…organization has no boundaries! First time user looking forward to visiting the tutorial site and exploring available features. Hi John. Thanks for the kind words. Yes, we have some admin features already in the works for mobile and will release a mobile upgrade this fall. These features didn't quite make it into the first release, but expanding the tool for sign up creators is our next focus! Great step in a SUPER great direction!!! Any updates as to when you might add in the admin functions to the mobile version?? Like see a sign-up and who is signed up for shifts etc, not just the ones I am signed up for...?